Writing and editing a 500 page book means, one way or another, a lot of time at my computer. When I wrote the last edition, I tried voice recognition software to see if it could free me from the keyboard. However, through that process I discovered that 80-90% of my "writing" time is actually spent editing, and voice commands really aren't effective for that. But sitting at a desk too long cramps up my upper back, and that eventually causes all kinds of other problems (like shooting pains down my arm). To address that, long ago I switched to a split keyboard (see below), and that helps a lot, allowing my hands and arms to rest apart at a comfortable shoulder width. But given enough time, my upper back still gets really tight. 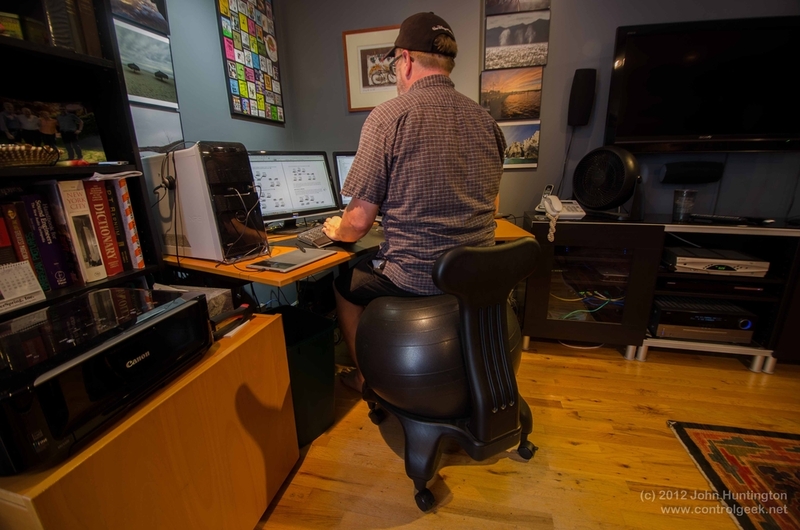 Wanting to solve this, especially in light of all the "sitting will kill you" hysteria, I searched around and found a lot of references to stand up desks. While I can walk all day, or work standing up on things where I'm moving a lot (like building something), I've never found standing in one place to be very comfortable. I did a few mock ups and tests, but I just couldn't find a comfortable standing position that would allow me to touch type and get to the mouse. So I discussed all this with my excellent massage therapist, and she mentioned that some of her clients had good results using exercise balls instead of chairs. Being kind of a klutz I thought for sure I'd fall off the thing, but I found a ball chair on Amazon and ordered it up. Sitting on the chair is kind of like sitting in my kayak on the water--my torso and hips stay loose. Having the wheels allows me to move around easily in the chair (I needed the chair leg extensions to get it to a comfortable height), and having that little back guard keeps me from falling off--I wouldn't call it a back "rest" because I only occasionally lean on it to stretch out. I spent probably hundreds of hours at my desk working on the book, and I didn't require one emergency visit to my massage therapist. During a break from storm chasing in May, I stayed with my sister and worked on the book in an old conventional chair she had around, and sure enough, within days all my back problems returned. Going back to the ball chair solved the problem once again. Last week, my sabbatical wound down and I was back at work in a traditional chair. Within two days my back started cramping up and all the old aches and pains returned. I just ordered another chair set up for my office! I think everyone's body is different, but I encourage you to not accept pain and experiment around and find what works for you!